Rev. Dr. Jesse Voyd Bottoms, Jr.
Rev. 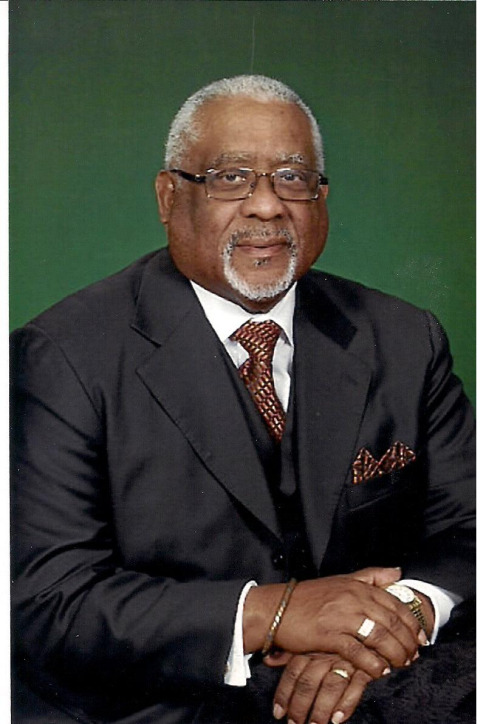 Jesse Voyd Bottoms, Jr. is a native of Louisville, KY and is the second of three children of the late Dr. & Mrs. Jesse V. Bottoms, Sr. Raised in Louisville, KY, he is a product of Louisville public schools. His academic work was at Kentucky State College, Frankfort, KY, Simmons Bible College, Louisville, KY, and Southern Baptist Theological Seminary, Louisville, KY. He holds a B.A. in Biblical Studies, Masters Of Sacred Theology, Doctor of Sacred Letters and several other Honorary Divinity Recognitions. His Doctoral studies are at Faith Seminary, Tacoma, WA. He served as pastor of the Second Baptist Church, Fairfield, KY from 1967 to 1977.
house in which he was born. In September 1977, he assumed the pastorate of the Beulah Baptist Church, Poughkeepsie, New York where he presently serves. The Beulah Church has experienced holistic growth and development under his leadership. Buildings have been built, property purchased, budgets increased, church taught to “tithe”, members added, mission projects funded, Community Development Corporation formed, community impacted, aggressive Soul Winning program implemented, adopted church in Uganda, ministers and preachers raised up and sent out and God glorified during his tenure. and Four Reasons Why I Tithe,The Bottoms Five Sermons” thirty-five volumes of five sermons each, and his latest, :”Why Does The Pastor Deserve An Anniversary?” a How To Guide for celebrating the pastor. Pastor Bottoms also developed the “I’m Going” button brochure, a simple and effective soul winning tool in wide use throughout the nation. Jubilee Christian Ministries and President of Jubilee Development Enterprises, Inc.
seven; great-grandfather of two and husband of Jacquette Delorse Hull Bottoms. Jacquette Delorse (Hull) Bottoms, affectionately called Sis. “B” by The Beulites. Sis. “B” is one of four children born to the late Mr. J.L. Hull and Mrs. Mary E. Hull. She is a native of Philomath, Ga and moved to Peekskill, NY at an early age. Mrs. Bottoms was baptized at Mt. Lebanon Baptist Church in Peekskill.During her time at Mt. Lebanon, she served in various capacities as well as attending Sunday School and Bible Study. in Industry Awards Ceremony, sponsored by the Harlem YMCA. She left Reader’s Digest to pursue other opportunities. Mrs. Bottoms is currently employed by a Domestic Violence Emergency Shelter in Southern Dutchess. Not only does Mrs. Bottoms own and manage the Jubilee Bookstore & More, her business mission is “Preparing the believer to study the word, show the word and share the word” Ezra 7:10. CHBA (Central Hudson Baptist Association), EMBC (Empire Missionary Baptist Convention), National Baptist Congress and Convention, USA, Inc are just a view of the venues that are used to sow into the ministry. Mrs. Bottoms loves the Lord and she loves the church. In addition to serving as chief advisor to The Pastor, she teaches New Members Orientation classes as well as a course in Biblical Principles of Financial Management. 1. Treat him with the proper respect. Treat him the same way you would a doctor, a lawyer, or a politician. A pastor’s role is more important than all these professional roles because he is God’s appointed leader for you and your family. Therefore esteem him very highly in love for his work’s sake (I Thess. :12-13). 2. Follow your pastor as he follows Christ (I Cor. 11:1, Heb. 13:7). Never blindly follow anyone but always follow the man of God who is following Jesus Christ as set forth in the Word of God (Phil. 3:17-21). 3. Pray for him often ( Eph. 6:18-20; II Thess. 3:1-2). You know how much opposition you receive from the world, the flesh, and the devil; your pastor receives even more, therefore pray for him! 4. Obey him as he admonishes you and teaches you the Word of God (I Thess. 5:12 and Heb. 13:17). These verses teach that you should submit, obey, and follow. 5. Do not speak against or listen to any gossip or slander about your pastor. I Tim. 5:19 reads, “Against an elder receive not an accusation...” And Eph. 4:29 reads, “Let no corrupt communication proceed out of your mouth...,” and Prov. 6:16 teaches that God hates for us to hurt people with words. Listening to gossip and slander is just as much a sin as speaking it. 6. Support him financially ( I Tim. 5:17, 18 and Phil. 4”10-19). This needs no explanation. 7. Encourage your pastor. Tell him when he has helped you. Eph. 4:29 teaches that we should speak that which edifies. You minister grace to your pastor when you tell him how he has helped you. It will also be very encouraging if you tell your Sunday school teacher, husband or wife, and children how they have helped or been a blessing to you. Praise doesn’t cost - it pays great dividends - in home, in the church, in the school, and on the job. 8. Be patient and understanding with your pastor and family. Do not expect your pastor or his family to be perfect, they are human. John I:5 and James 5:17 teach that a man of God has the same human weaknesses and temptations that we all face. 9. Stay busy serving the Lord. This will bless your life and be a tremendous encouragement to your pastor. You have a spiritual gift, so use it. John 1:17 teaches, “If ye know these things, happy are ye if ye do them.” Happiness doesn’t come from knowing what is right, happiness comes from doing what is right. Therefore, serve the Lord. The text depicts a trying time in the life of the army of Israel. David is the King. It was trying because for many years now, the Children Of Israel had been at war with the Philistine army. You remember David, don't you? - We meet him in the scriptures as a delivery boy who is sent by his father Jesse to take some lunch to his older brothers who are fighting in the army of Israel when Saul was king. Now, much had happened since we first met David. The scepter had been snatched from Saul's hands because he tried to play Jesus by being both Priest and King. Samuel had poured out the oil and David has been anointed to reign in the stead of Saul. David is King now and has led Israel in several warfare campaigns. At the time of the text, David and Israel had just returned victoriously from a long and grueling war. He had lost many men, many were wounded and all were tired and footsore. - After this bloody battle, King David was preparing to rest, relax and recuperate. Just as he was beginning to get comfortable and get a little rest, a messenger comes to report that the enemy had regrouped and was coming against them again. The word was that they were marching towards Israel's camp in greater force than before. The messenger said, King, don't relax now. There's no time to rest and recuperate now, the enemy is on the way. Isn't life just like that sometimes? Just as soon as God blesses you to overcome and be victorious in one battle, before you can shout the victory, Satan has placed you under attack again. I think the saying is right when they say “if it ain’t one thing, it’s another.” Have you ever had to climb up the mountain and struggle, pray, fast, consecrate yourself only to find that when you have successfully climbed that mountain you look up and see another one before you? There are times like that in all of our lives. Many people call it different things. Some say, “My luck is running bad.” That’s the only word that God couldn’t spell “luck.” Some say, “The stars are not in my favor." In the time of the text, David is experiencing something like this. Here they are with blood still dripping from their swords. Many of their wounded are still unattended and many of their dead are still unburied on the battlefield. And now the enemy is marching with even greater force than before. The Bible tells us what’s going on. And what’s going on is this. The Bible says that Satan stood up. That implies that Satan had made a move that he had not previously made. I don’t know about you but I have discovered in my life, in my church, in my home, in my family, in my community that the Devil can be a pretty rough fellow sitting down. I have discovered that Satan can raise a ruckus just sitting down. Satan can cause enough confusion sitting down. But the text declares that Satan stood up. Which means that he was concentrating all of his efforts on David. I can imagine how David must have felt. I can sympathize with David because there have been times in my life, where and when I knew without a doubt, that Satan had stood up. Let me see if I can make you see this. I remember years ago when I was a boy and my Father would tell me to do something. My mind would be on something else and he would tell me again. I still sat there and didn’t respond the way he wanted me to and if he was sitting down, then he would stand up. When he stood up I would get in line immediately. Because when he stood up I knew for sure that he meant business and that he was going to use all of his strength and belt, to make sure that I understood and did what he wanted me to do. Look at Satan sitting down, causing all kinds of trouble for David and the army of Israel. And here they are still ignoring him; they are still praying, still going down on their knees, still praising and and still marching forward with God. They were still honoring God in the midst of their difficulties. They were still praising God and they still had enemies. Satan said, wait a minute, I better stand up. I’ve seen a lot of people lose their testimonies because Satan stood up. I’ve seen folk in our church people move their seats from the front all the way to the back because Satan stood up. I’ve seen churches split and fight one another because Satan stood up. I’ve seen choirs that could no longer sing together because Satan stood up. I want to tell you that when Satan stands up our faith will falter. I’ve seen good church members, or what we thought were good church members, throw in the towel because Satan stood up. When Satan stands up, if we are not prayed up, we’ll fall down. I think you need to know that the reason that Satan “stands up” on you is to get you to “sit down” on God. The text says that Satan stood up and provoked. And I want you to know today that Satan is a provoker. When Satan stands up he provokes God’s children. When Satan stood up he provoked David to do something that we see in the 7th verse that God was displeased with. David, a man after God’s own heart, is now displeasing God. David is provoked by the rising of Satan. It matters not how strong you think you are in the Lord. No matter how much you think you know about God’s word, don’t look down on anybody else, because one of these days, Satan is going to stand up in your life. – Don’t you dare laugh at other folks because they are having problems, because they are having trouble, because trouble is just going in a circle and is on its way to your house. And after a while it will be knocking on your door. I tell you, when Satan stands up he can be so forceful that he can make you believe that even your own God has let you down. Satan stood up against David to make David sit down on God. Look what happened. He provoked David to number Israel. Now, that doesn’t sound like anything evil. After all David was the commander in chief of the Israeli army. After all David was the King. It doesn’t sound like anything was wrong with a commander counting his men. So why was God displeased? The Bible says that Satan provoked David to number Israel, to count Israel. – It seems proper for David to count his men seeing that there was an army coming against him in greater numbers than he had seen before. Go number our men. Go count them. We need to know how many able bodied men we got standing. How many cavalry men; how many in the Infantry; how many officers, count them, we need to know. We need to know how many are still standing. Count them. – Now, it doesn’t seem like anything is wrong with that. The Bible says that God was displeased. And the reason that God was displeased is because David was reacting to what the Devil had done. I want you to know today that Satan will send an enemy into your lives with a great force. And all he wants to do is see your reaction. He wants to observe what we are going to do as children of the King. All the Devil is trying to do is to get us to lose a little faith in the Lord. And that was what God was displeased with. Satan uses trouble to lower our faith level. God saw David’s servants running to and fro counting and counting and counting… and God looked and said, David, David, what are you doing? David said, Lord, I’m counting. David, what are you doing? “I’m counting.” What are you counting David? David is saying that the enemy is coming is such a great number that I better count. I got to know my man power. Yes, with all that enemy coming, I got to know my man power. God says, you mean to tell me you are counting man power. God said, David, you never counted man power before. – When you were just a shepherd boy, out on the battle field in the Valley of Elah, you didn’t bother to count manpower. You just went out to meet that giant in the name of the God of Israel. Now you are counting. David, what made you change. It use to be Me, you and the men. Now it’s the Men, you and then Me. You use to follow me and the men followed you. Now you follow the man and you want me to follow you. David, you want to do it your way and still have the benefits of being in my will. David, you can’ t do it your way and still be in my will. That’s why God was displeased, because He saw a drop in David’s faith level. And whenever your faith level goes down and causes you to count, God is displeased. Counters will never become tithers and liberal givers. Counters will never know blessing and joy of obedient giving. Counters count their supply. Tithers count on the supplier. Counters count what they give to God. Tithers count what God has given to them. I need to tell you, that wherever you are and whatever you got, you don’t have it because you are such a “go getter”, but you got it because God blessed you with it. And don’t you dare get the big head and think that you are so deserving and that you are the only one who can do it, and that you are the only one God has left… He’s got plenty of people waiting to step right in and take your place. Some people began counting when the stock market went down. Some starting counting when IBM downsized. Some started counting when the big banks and financial institutions had to be bailed out. But I want you to know, that I serve a God who can take you from the Red to the Black without Big Blue (IBM). – My God was blessing me before I ever heard of Wall Street. And anyway, I thought the Stock Market was where that bought and sold live stock, cows and hogs and all that stuff. Every now and then, the Lord stands back and watches Satan rise up in our lives, just to see how much faith we have in Him. The text said that God sent a prophet to David and said to him, David, you angered God. You’ve lost faith. The Lord was waiting for you to pray and instead of praying, you started counting. – How often do you lay down at night worried, anxious and concerned, and instead of praying, you start counting? That displeases God. That displeases Him because He is our Father and He has promised to supply all of our needs according to His riches in glory. The one thing that angers God is when His children loose faith in Him. Look at Moses. Moses didn’t count at the Red Sea. And I’m glad he didn’t. He didn’t count and neither did he take a vote. If he had put it to a vote they would have still been in Egypt. – But what happened is that he stood still, and the salvation of God was extended to him. God says to David that what you’ve done displeases me so, and is so detrimental to your service that I have to punish you. I love you David, but I want you to never forget what it costs to lose faith in me. God gets angry when we lose faith in Him. The prophet Gad said to David, the Lord told me to tell you that He is going to have to punish you. But the Lord told me to tell you, I’m going to give you three choices of punishment. Look at the three choices for losing faith in me. Your first choice is, three years in the hands of Mother Nature. In other words, three years, I will close up heaven for three years. For three years there will be no more rain. Three years in Mother Nature’s hands. David begins to think about it. David said how would it be to spend three years in the hand of Mother Nature. You see, Mother Nature can be so cold. Mother Nature can let the sun shine and never go down. Mother Nature can send Katrina and Irene and blow you away or wash you out. Mountains could become boiling pots and spew their volcanic lava and God would not be around to stop it. For three long years, the wind could blow and God would not be around to say, peace be still. For three years, rain could fall and there wouldn’t be a rainbow to bring it to a close. David thought about it and said, wait a minute, please let me hear the other two choices. The prophet said your next choice is three months in the hands of man. Man’s hand…. David begins to think about it and said what would it be like in the hands of man with God not around? Man’s hand? Man – who will smile in your face and stab you in you back. David said Man’s hand? Man, who will love you today and hate you tomorrow. Man’s hand? I’m a man. I know what a man will do, because I’m a man and I know what I have done. Man will take your wife, get her pregnant and arrange to have you killed. Man can be dirty. Man can be grimy. Man can be lowdown. David began to think about it and said naw, naw, naw, naw, naw…. Please let me hear my last choice. Well, your last choice David is three days in hand of God. David said that doesn’t sound too bad. But I think I need to tell you David that can’t nobody whip you like an angry God. When God gets ready to whip you, can’t nobody whip you like God. I’ve seen babies die in their mother’s arms, because that mother had been taken from the hand of God. I’ve seen strong men lie flat of their backs, not being able to move anything but their eyes, because they had been knocked from the hand of God. David began to look at his choices. David said; wait a minute, three years in the hand of Mother Nature; three months in the hand of Man; three days in the hand of God. Mother Nature… Naw… Naw… Naw… Nature is so unrelenting. The Sun might not know when to go down and come up without God. Winter’s blight might last too long and get too cold without God to set the thermostat. The earth might change it’s rotation without God to regulate it. Naw.. Naw.. I don’t think I want nature, because nature is so unforgiving. Three months in the hand of man… Three seconds in man’s hand is too long, I know I don’t want that. David said, “let me fall in the hand of God, for very great are His mercies.” David seemed to know that God was a God of mercy. Well, as I close now. My mind goes back to when I was a boy in Frederick Douglas Elementary on Pearl Street in Louisville, KY. Sometime I would misbehave in School, and Mrs. Anna L. Huddleston would call the house and tell my Mamma that I had been acting up in the class. Mamma would take Mrs. Huddleston's word for it and would not give me a chance to give my side of the story. Mamma would say boy, I told you about acting up in school and I’m going to whip you. She would say “a hard head makes another part of the body soft.” Mamma would say, boy, “I’m going to whip you or do you want to wait for you Father to get home and let him do it. Well, I thought about how Mamma would whip and how Daddy would whip. Now, Mamma would make a long drawn thing out of it. Mamma would whip and whip and whip and get tired and take a rest, keep on talking about it and then get mad and whip some more. She would say, “stop that crying or I’ll give you something to cry about.” The more you cried, the more Mamma would beat you. Now, my Daddy was a strong man and could whip hard. But I knew that if I cried and hollered real loud while Daddy was whipping that he would have mercy. So I would go in the kitchen and say Mamma, that’s alright, I’ve made up my mind that I’m going to wait until Daddy gets home. I heard David say, I don’t want you to leave me in Mother Nature’s hand, naw, naw… I don’t want you to leave me in the hand of Man. David said, I thought about it, and I have decided… Leave me, leave me, leave me, l-e-a-v-e m-e – in the hand of God. I know I’ve done wrong, I know I disobeyed him, but leave me – in God’s hand.. Because He is my father and even though HE is whipping me, at least I know that He has His hands on me. And I know that if I fall down, if I fall down, if I fall down on my knees and tell the Lord… Tell the Lord, I know that I’ve done wrong - Lord, I know I have disobeyed you. L-O-R-D, I know I have done wrong, forgive me… forgive me… Try me one more time..
Somebody said that you are in good hands with Allstate. But I got better hands. – Satan stood up one Friday, and when he stood up he thought he took Jesus down. Jesus did say that if you take this temple down it will only be down for three days. Jesus asked Joseph of Arimathea to let Him borrow his tomb. Joseph said I can’t give it to you because I’ve spent too much money to have it dug for the memory perpetuation of my family. My children and those go come after me need to be able to come to my tomb and remember. For that reason Joseph said, I can’t give it to you. Jesus said, Joseph I think you misunderstood me, I didn’t ask you to give it to me, I asked you to lend it to me. If you let me have it Friday afternoon, I’ll give it back to you early Sunday morning. He got up, early, early Sunday morning, with all power in His hands. All power in those nail scarred hands. I want to be left in the hands of the Lord. I want to be left in those powerful hands. I want to be left in those nail scarred hands. He will… He will… He will… Fall on your knees today, tell the Lord, I am your child.. Leave me… Leave me… Leave me… in the hand of God. - Ain’t He alright…. Don’t leave me in Nature’s hand… Don’t leave in Man’s hand… Leave me in the hand of the Lord… Ain’t He alright… I want to be with the winner. He is the super-super-super bowl winner. I'm glad I'm in the Lord's hand. God gave the ball to Adam. God called the play and put the ball in Adam's hand. Adam was carrying the ball but Eve changed the play and Adam ran into a tree and fumbled the ball. Noah got the ball but he also got a bottle and got drunk on the eve of re-construction and fumbled the ball. Nimrod called a wrong play, built a tower but fumbled the ball. Abraham picked up the ball. He ran the ball through Egypt and Gerar, told the same lie twice to Pharaoh and Abimelech, that his wife was his sister and fumbled the ball. Isaac picked up the ball but he told the same lie his Daddy told and fumbled the ball. Jacob picked up the ball, ran a trick play and stole his brother's birthright and lost the ball. Moses got the ball at a burning bush in a desert on the back side of a mountain in Median but he killed an Egyptian and Satan made him fumble the ball. They gave the ball to David. David, the man after God's own heart was doing well. But while running down the sideline he saw a cheerleader named Bathsheba and ran out of bounds. God the father decided that if you want something done right you got to do it yourself. So God decided to get in the game Himself. So God got in the game one cold December night in a little town called Bethlehem, when the word became flesh. One of His own team members told the opponents the play they were running. He said the one that I kiss will be carrying the ball. His name is Jesus. He's the one. They gave Him the ball at Pilate's judgment hall. He carried the ball from judgment hall to judgment hall and through the Via Dolorosa. He carried the ball up that skull shaped hill called Calvary and they tackled Him one Friday. It was a pile-up. He was covered up. It didn't look like He made it. He was covered up all night Friday night. He was covered up all day Saturday. He was covered up all night Saturday night. But EARLY. Somebody help me say EARLY. Early Sunday morning, somebody help me say TOUCHDOWN.